Feeding ministry program in Nicaragua. Despite the challenges they face, we were blown away with the work they are doing in their communities, with the lives that are being transformed, and with the leaders that are emerging from their congregations. One young man from Lesly’s church shared his story of exiting the world of gang violence, drug abuse, and glue-sniffing to becoming salt and light among his former peers. As we heard the Herreras’ heart for outreach, we also had the opportunity to see the Jinotepe feeding program in action. 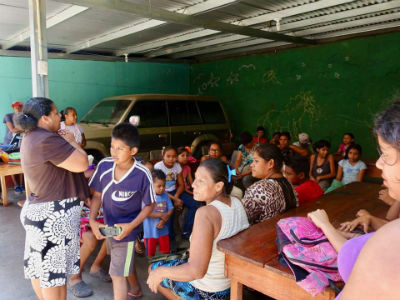 Three times per week, kids gather under a covered area while Guillermo’s wife Juanita shares from the Bible. The food is simple but good, and, even more importantly, the children come away nourished in body and in soul. To support this feeding program, click here. Although Nicaragua has been a largely peaceful country over the past couple of decades, years of poverty and oppression have led to tension simmering below the surface. That tension exploded the weekend we were there, as student protestors demonstrating against reforms to the health care system clashed with government forces. Some accused the government of planting violent activists in order to give the police an excuse to crack down. Pastors Guillermo & Lesly Herrera with family & church leaders. We must confess that we were a bit relieved to board the plane at the end of our trip and return to Costa Rica. Josiah seemed relieved that he wasn’t going to hear more “booms” (small mortars) at night. Still, we left with heavy hearts, knowing that the problem isn’t over for our brothers and sisters in that beautiful country. The protests have continued to escalate after that violent weekend. Several dozen have died, so we ask you to pray fervently for God to bring resolution to the ongoing struggle. 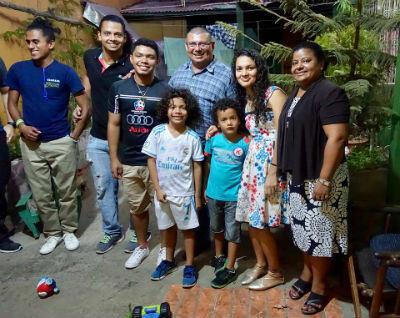 We also ask you to pray for the Herrera family as they work hard to minister every day to a people desperate for a word of hope and a taste of the Bread of Life. Jason and Abby Torgeson are Global Strategy regional consultants for Latin America. Learn more and discover ways to support their ministry at http://chogglobal.org/team/jatorgeson/. Article originally published in the family’s June 2018 newsletter. This entry was posted in All Church of God and tagged Abby Torgeson, Costa Rica, feeding program, food ministry, Global Strategy, goals, Granada church, Guillermo Herrera, Jason Torgeson, Latin America, Lesly Herrera, Missionaries, missions, Nicaragua, overcoming challenges, self-sustaining, the Torgesons, unrest, violence. Bookmark the permalink.